Gloria Allred will be there. And so too, We Support the Survivors of Bill Cosby. That’s not what Bill Cosby said in a brief video posted Monday ahead of Saturday night’s scheduled performance at Atlanta’s Cobb Energy Performing Arts Center, but it might as well have been. In response, grassroots group We Support the Survivors of Bill Cosby urged its followers to post comments at the Atlanta Journal-Constitution end. Although the Cosby show will take place in the direct shadow of Mayweather vs. Pacquiao, there’s no doubt that images and video of protesters will linger on social media. Since the performance is also a stone’s throw from CNN, expect the cable news network to cover aggressively as well. Attorney Gloria Allred brought alleged Cosby victims to Denver earlier this year and has indicated she plans to do so again this weekend in front of Cobb. 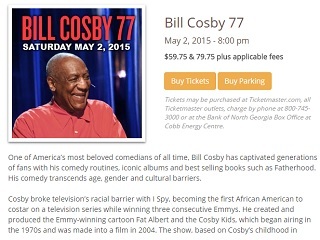 At press time, a petition created by We Support Facebook group members Brandy Betts and Jen Johnson asking promoter Outback Concerts to cancel the May 2 Cosby performance has crossed 10,000 signatures. At a press conference in New York City chaired by Allred, two more women have come forward with accusations of sexual misconduct against Cosby. One of the new accusers, Lili Bernard, says she and Allred met with police in Atlantic City Thursday for five hours, to discuss the allegations and present evidence. There is no statute of limitations in New Jersey on sexual assault crimes.